Crafty Little Beana: WoW! Time gets away from me! I know bad blogger! WoW! Time gets away from me! I know bad blogger! Well it has been a while, Geez! 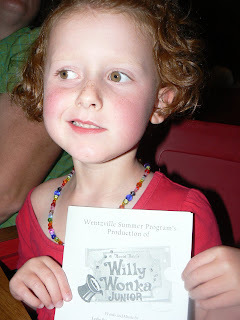 We went to see a friend of ours in a production of Willy Wonka last night. It was really cute. I forgot to post last week that I cut Gina's hair all off! She loves it. The last time she got it cut she wanted my mom (retired stylist) to go shorter, I think my mom was scared to go too short. Well here we are and it is so much easier for the summer, cooler too. Here is our friend the "actress" after the show! My sister (her aunt) made a fabulous chocolate flower bouquet! She is so creative. 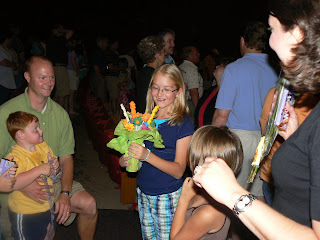 How fitting a colorful chocolate flower arrangement for Willy Wonka and the Chocolate Factory! So Smart! Gina made her a bracelet with her name on it. 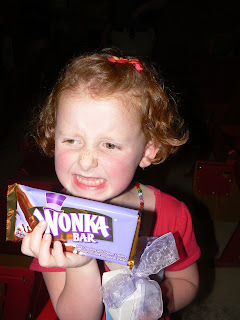 And Kenzie's (aka the actress) mom gave all of the kids Wonka bars! It was so sweet! Awww, such a cute haircut! I love it...and it looks like it would be so much easier to manage :) I have been so tempted to cut Emma's hair because it is so thick and many times unruly, but I can't bear to part with Claire's long curls! Willie Wonka must have been incredibly fun....my Emma would love it...it's her favorite :) Hope you have a great weekend! She looks so cute! I wish my hair would do that! Thank yous are in order!